Ryorin's Ramblings: Ode to the Absurd or Thank You, Cable & Deadpool! 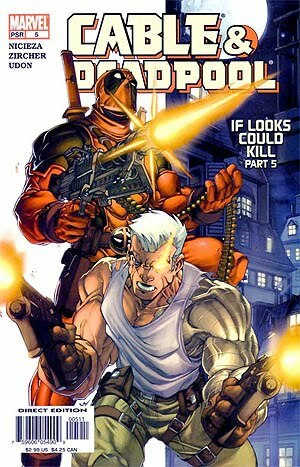 Cable & Deadpool got me into superhero comics. I don't mean I grew up in a world devoid of the light of comics. Heaven knows that's not the case. I was a kid fortunate enough to be born into a geeky family that recognized comics as a legitimate storytelling medium. I grew up in a household blessed with collections of American syndicated comics like Calvin and Hobbes and with two thick omnibuses of the French adventure comic Asterix and Obelix. We even had Maus laying around, though it was too dark for me to get through when I was little. Often, we would get Archie comic digests at the grocery store or borrow Tintin comics from our local library. Through middle and high school, I devoured manga like the ravenous geek who grew up on Dragonball Z that I was. I have also always been interested superheroes. Sure, I watched Japanese superheroes save the galaxy a lot on Dragonball Z and Voltron and I always loved the Jedi of Star Wars, but I was always interested in the more conventional American superheroes too. I grew up watching mutant animals protecting New York in Ninja Turtles, the Justice League battle the Legion of Doom in Super Friends, the Thing unleash clobberin' time on Dr. Doom on Fantastic Four, and I even saw mutants overthrow the disgusting other-dimensional dictator Mojo in X-Men. I watched superhero movies like Spider-man, Superman, and even the infamous Batman and Robin. I knew the origins of the Fantastic Four, the Hulk, Spider-man, Superman, and Aquaman. I even knew who Doomsday was. I played the City of Heroes MMORPG and loved the few issues of the comic that we had (available in completely legal PDF form here; I recommend the Blue King run and the first twelve issues of the Image run, but the rest is fun too). I just didn't read Marvel or DC comics. Let's face it: Marvel and DC are intimidating. There are decades of history behind any one of their series and I didn't really have any friends who read Marvel or DC to explain it to me, just a lot of other manga fans. I had one friend in high school (another manga fan) who explained the basic plot of the Dark Phoenix Saga to me after we saw X-Men The Last Stand, but she had never read any of the comics either; she just had the X-Men Encyclopedia. For the most part, I ignored the Graphic Novel section of a book store except for the manga portion of it and, while I did go to my local comic shops, it was for manga and anime and Star Wars instead of, well, superhero comics. And then I entered college. Cue dramatic music and, no, the Ninja Turtles theme song does not count. Freshman year I was in the campus coffee shop talking to a friend of mine when the topic of superheroes came up. I mentioned how I had always been interested in superheroes but never found my way into the Marvel and DC universes. My friend (a real, live superhero comics fan!) asked me if I had ever heard of Marvel's very own fourth-wall breaking insane mercenary Deadpool. Last year, he finally loaned me Cable & Deadpool, along with some Runaways and Ultimate Spider-man. And now I am firmly entrenched within the worlds of Marvel and DC and I'm not planning on leaving anytime soon. Let's just say that my friend hit the nail quite soudly on the head with his recommendation. I love series that aren't afraid to laugh at themselves, but can still have a strong plot. 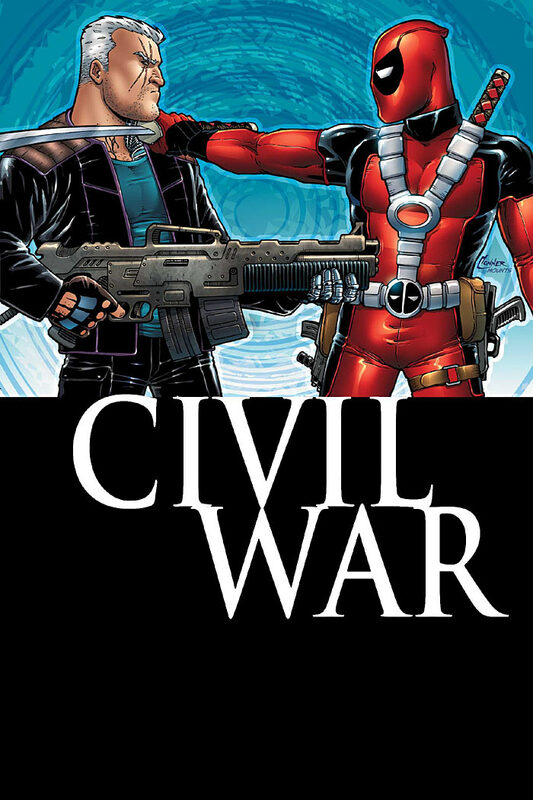 Cable & Deadpool is that series. Deadpool, as mentioned above, is insane. He's the comic relief of the Marvel Universe and is fully aware of his status as a character in a comic book. Cable, on the other hand is a Summers. He's Cyclops' time-traveling son with a Messiah complex from a dystopian future. He's a very ends-focused character trying to build a perfect world. He's got a ton of back-story, but I could still get into the series and know what was going on. And he and Deadpool balance each other perfectly. 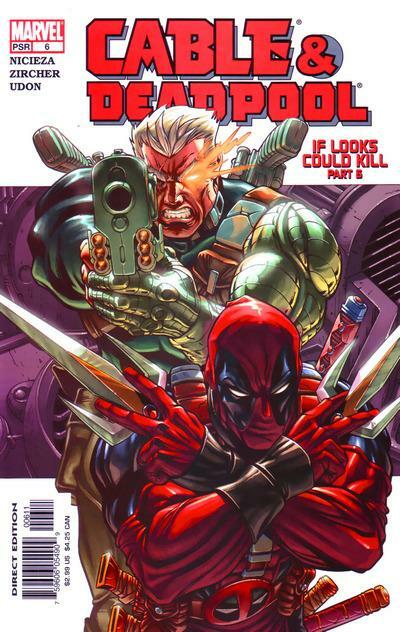 Cable & Deadpool probably isn't the perfect gateway series for everyone. Both of the title characters have long, convoluted back-stories and major plots from the rest of the MU occasionally spill into the story (like Civil War and various X-Men plots). But for me, the series was perfect. It starred relatively obscure characters. It juggled serious moments and comedy. It had character development and a wide variety of character interaction. It had great art and wonderfully parallel first and last scenes. It occasionally breaks the fourth wall. It was over the top but still got me to think. And it allowed me to finally enter a printed world of superheroes. Maybe I would have started reading Marvel and DC even if I hadn't heard of this wacky, lovable series. Maybe I would have browsed through the "Graphic Novel" section of my campus library and found Astro City and Doctor Strange and Sandman without having borrowed anything from my friend. Maybe I would have found Ultimate Spider-man and Runaways even without asking after my friend's earlier recommendation. But maybe not. So I would like to thank Fabian Niciezan for creating such a ridiculous, wonderful series. You've given me the key to more wonderful stories and characters than I know what to do with. Keep up the good work. Is there a book or series you would like to thank for introducing you to something new? What an entertaining, splendid blog entry! You have quite the turn of phrase!